This June, several of our MAFCS members traveled to Seattle, Washington to attend the National AAFCS conference. Below are pictures from their trip! Birdsell receiving her national award at the AAFCS Conference this past summer. 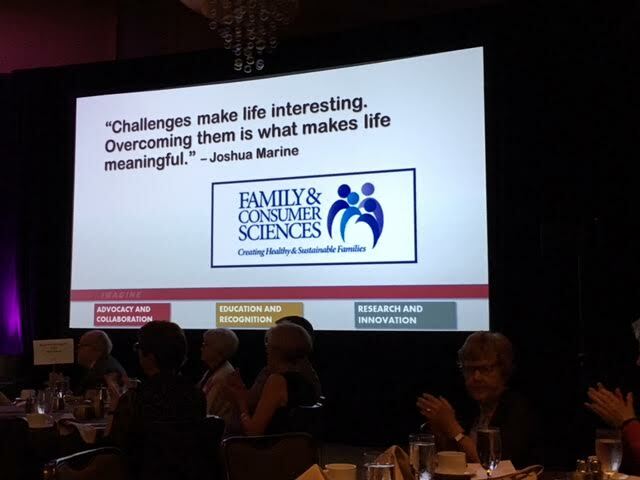 The American Association of Family & Consumer Sciences (AAFCS) honored its New Achievers Award recipient and other award recipients at a ceremony during the 105th Annual Conference & Expo in St. Louis, Missouri this past summer. Hilary Birdsell, family and consumer science educator, Central Public Schools, Norwood Young America, Minnesota, was selected for the prestigious award. The AAFCS New Achievers Award recognizes emerging professionals who are demonstrating through their innovative programs or curricula the potential for making significant contributions in family and consumer sciences. Award recipients are professionals with three to eight years of service in the field. creating each curriculum, Birdsell tries to incorporate a wide variety of learning experiences, such as field trips or service learning projects, to enrich the class and works to articulate her classes for college credits. An active member in her community and at the state level, Birdsell participates in local 4-H judging, is co-chair of the Awards/Recognitions, Scholarships, and Best Practice Grants for the Minnesota Affiliate of AAFCS, and has presented at two Minnesota State Conferences. The Minnesota Association of Family & Consumer Science is proud to have Hilary represent them at a national level and a leader in our field. during the AAFCS 105th Annual Conference in St. Louis, Mo. Alexandria, Va. – July 17, 2014—Nominated by the Minnesota Association of Family & Consumer Sciences, Sew Much Comfort, headquartered in Burnsville, Minn., was honored with the American Association of Family & Consumer Sciences (AAFCS) 21st Century Community Champion award for their efforts of providing free adaptable clothing to wounded soldiers across the country. Michele Cuppy, president/CFO and co-founder of Sew Much Comfort, along with her Vice President, Linda Trumble, accepted the award presented by AAFCS President Peggy Wild, CFCS, and AAFCS Treasurer Sister Victoria Marie Gribschaw, SC, CFCS, at the AAFCS 105th Annual Conference & Expo in St. Louis, Mo., on June 28, 2014. The conference theme was Global Gateway to Healthy and Sustainable Families. Established in 2001, the AAFCS 21st Century Community Champion Award recognizes groups, organizations, and companies that promote the connection between strong families and strong communities by creating viable projects and activities that build communities in which families are valued,supported, and strengthened. The first recipient of the award in 2001 was the Annie E. Casey Foundation in Baltimore, Maryland. Sew Much Comfort, a program that provides free adaptive clothing, was founded in November 2004 by Michele Cuppy and Ginger Dosedel. Since its founding has distributed more than 137,536 pieces of adaptive clothing to wounded service men and women. Volunteers from all across the United States, Germany, and Europe are helping in the creation of adaptable clothing that is distributed in all major hospitals in the United States, Landstuhl, Germany, and at Combat Surgical hospitals. Meet the 2014 Teacher of the Year! Jeanne has taught FACS classes at the Hibbing junior and senior high levels for more than 30 years, including 28 years in the Hibbing Public Schools. She has also been an advisor for extracurricular clubs as well as served on district committees, the System Accountability Report Committee, chaired the Business Education Partnership Board for Career and Technical Education Course and has been a secondary Carl Perkins coordinator for 14 years. As a teacher she has used hands-on experiences to adapt to a variety of learning styles. She has also involved her students with several community service projects for Habitat for Humanity, booster clubs, the Minnesota Workforce Center, the Hibbing Area Chamber of Commerce and The Salvation Army. Bymark initiated the Early Childhood Family Education Program in Hibbing and served as the parent educator for four years.